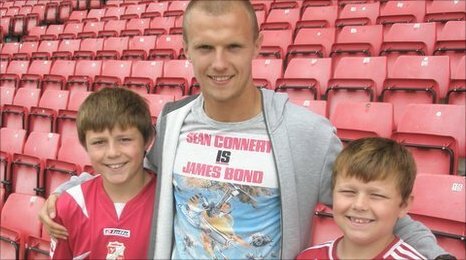 There are many things Swindon Town's new loanee David Ball was probably expecting when he turned up at the County Ground. But a grilling from Robins fans Billy and Charlie Forster probably was not one of them. The two brothers, aged 9 and 11, from Broad Hinton School quizzed the Manchester City striker on matters ranging from his reasons for signing to his ideal sandwich. The boys asked the questions the fans wanted to hear, like who was the one person he would like to be stranded on a desert island with. His reply, Jessica Alba, was met with concern from the brothers who were aware that he had a girlfriend. He even turned film critic, after being asked if he would like to see Toy Story 3 he replied: "It's quite good so you'll enjoy that." Ball is a product of Manchester City's impressive youth academy, and joins the likes of Stephen Ireland, Micah Richards and Nedum Onuoha in breaking through the ranks to play professional football. He had to endure an injury-plagued season last year, after breaking the same bone in his foot twice and spent a total of five months on the sidelines. The 20-year-old was also linked with a loan move to several Championship clubs last season so it is considered quite a coup for Danny Wilson to have pulled off. He has joined Swindon on an initial six-month loan deal, but is already looking to increase that to a season-long agreement. I'll be there at the end of the season and hopefully go up to the Championship."